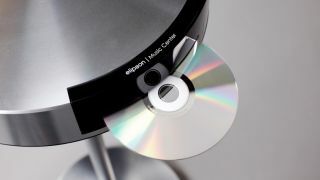 Elipson Audio announces "new and improved" Music Centre | What Hi-Fi? Elipson Audio has introduced its "new and improved" Music Centre, which now comes with the ability to stream music from Bluetooth-enabled devices – including smartphones and tablets. It's part of the French manufacturer's bid to deliver an "integrated audio solution" and a "hub for all wired or wireless music sources" as music streaming becomes increasingly popular. In addition to the inclusion of Bluetooth, the £900 Music Centre incorporates a DAB/DAB+/RDS FM radio, a CD player, a touch-sensitive control panel and a luminosity sensor. The Music Centre's wired connections include a USB input; two stereo analogue inputs; and a digital optical input, as well as a 3.5mm headphone output, pre-amp and sub outputs. A switching amplification solution provided by Bang & Olufsen ICEpower has also been used in the construction of Elipson's new Music Centre, which delivers 2 x 120W at 4ohms. French designer Jean-Yves Le Porcher has been responsible for crafting the exterior of the new Music Centre, which is now available to purchase – along with a £90 floor stand accessory.